Ok, we’re winding down to the end of our country-by-country list of 2011’s also-rans: the songs that should-have/would-have/could-have gone to Germany if the people had voted differently/if the juries had taken their bathroom breaks at a different time/if the networks had been bribed by a different record company (just kidding! I think…). Sweden: As almost any self-respecting Eurovision Fan would know, Sweden’s Melodifestivalen is considered one of the biggest events of the National Final calendar. Its position in recent years as the last of the national selections means that it’s basically the final stop before the big event in May. It tends to get higher viewership numbers in its homeland than Eurovision itself does, and ESC fans the world over flock to the Globen each year in order to watch the final firsthand. This year’s Melodifestivalen certainly did not disappoint, with 32 songs competing over four semifinals and an “Andra Chansen (Second Chance)” round for the chance to redeem Sweden’s Eurovision hopes after a tough crash-and-burn last year. As we all know, Eric Saade not only came out on top this year with “Popular“, but he gave the Swedes their highest placement on the ESC scoreboard since their victory back in 1999. “Stotinama Godina” reminds me of the classic Croatian ballads of years past: songs like “Neka Mi Ne Svane“, or “Nek’ ti bude ljubav sva” (which, interestingly enough, Jacques performed during the national selection process). It’s hard to say if this would have made it into the Final (I’m sure that some would have argued that it sounded “dated”), but I personally preferred it to “Celebrate”. As for Jacques, I wouldn’t count him out. In a commercial for this year’s UK version of “X-Factor”, eagle-eyed viewers can catch a quick glimpse of Houdek auditioning for the show that introduced the world to Jedward. Brace yourselves, my friends. Denmark: “New Tomorrow” by A Friend in London brought the Danes their second consecutive Top Five placement, and may have given Jedward and Poli Genova a bit of competition in the “Best Spiky Blonde Hair” category this year. But the runner-up at this year’s Dansk Melodi Grand Prix was no slouch, either. Anne Noa’s “Sleepless” felt like a breezy blend of Taylor Swift and Selena Gomez, and could have easily been a worthy follow-up to the youthful puppy-love of Lena’s “Satellite”. How can you argue with those cellos, that attitude…that YODEL? It’s exceedingly difficult to not sing in English at Eurovision, yet still have everybody singing along with your hook (just ask Magdalena Tul)…but I’m pretty sure that Ithaka Maria would have had Ruslana fans (and many others, for that matter) absolutely eating out of her hand. Finland: Paradise Oskar may have “Da Da Dam“ed his way to Düsseldorf, but he had to defeat a fairytale princess and a former monster to get to the top of the heap. Finland’s runner-up this year was Saara Aalto’s saccharine-sweet “Blessed with Love” (if Eurovision’s rules had allowed animals on stage, I’m pretty sure we would have seen Bambi, Thumper, and Tweety Bird singing backup…but then again, with the LED screen, I’m sure anything would have been possible). If sweetness isn’t quite your thing, how about the glam-rock of Stala and So.’s “Pamela”? Lead singer Sampsa Astala is the former drummer for Lordi, who famously took the Eurovision crown to Finland for the first time back in 2006. Next up: Georgia, Germany, Greece, and Iceland! Albania: For me, the Albanian Preselection (or Festivali i Këngës) is one of the more underrated events of the Eurovision year. It occurs early in the ESC cycle (generally falling around Boxing Day), and it tends to involve both young, fresh faces as well as veteran performers. This year’s FiK winner was Aurela Gaçe’s “Kënga Ime”, which eventually became the epic, aquiline “Feel the Passion“. However, in second place this year was the lovely duet “Ende ka shpresë (There is Still Hope)”, written and performed by Alban Skenderaj and Miriam Cani. I don’t know if this song would have been translated into English (as so many other Albanian entries have been over the past few years), but if it had, it could have possibly given Azerbaijan’s Ell and Nikki a run for their money. During my time at the Press Center in Düsseldorf this year, I had the great (and often surreal) pleasure to get to know a number of 2011’s Eurovision performers. I sipped tea with the Greeks, chatted with the Icelanders, danced with the Armenians, practiced my Portuguese with Homens da Luta, and raised a few toasts with the Bulgarians. However, one of my favorite artists to work with was Italy’s Raphael Gualazzi. After having the chance to interview him for ESCKaz, we would often run into each other as he went from rehearsals to press conferences to interviews and back again, always sharing a quick smile and a “ciao”. I sat in the second row during Raphael’s intimate showcase at “Jazz in der Alten Schmeide”, and saw firsthand how much he and his bandmates truly feel their music, a fantastic, soulful blend of old-school stride piano fused with modern blues, funk, and jazz. When “Madness of Love” defied expectations and quietly climbed up the leaderboard on May 14th, ultimately making its way into a surprising (to some, anyway) second place finish, I may have been celebrating louder than the Italian delegation itself. I had the chance to catch up with Raphael this week before his gig at the Teatro Tenda in Vascon, near Treviso. Despite an often-fuzzy cell phone connection, I was able to get a few questions in. 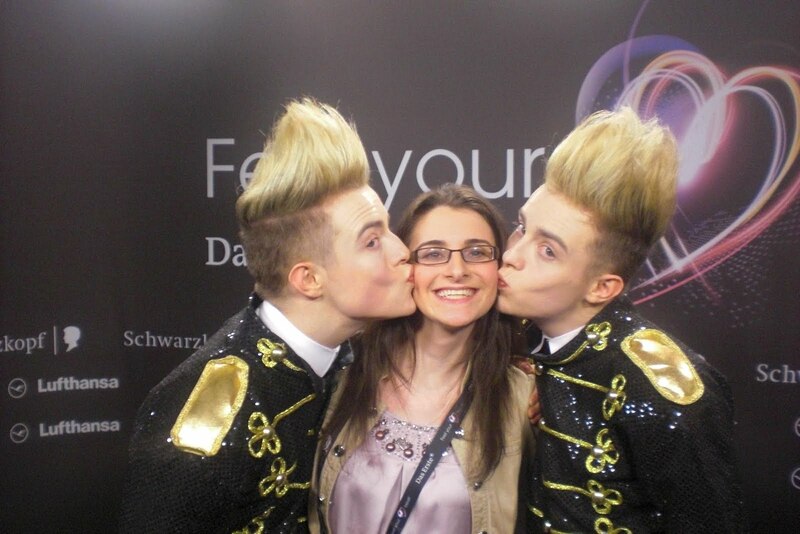 ESC Insider: It’s been over a month since we’ve last talked…how has life been since Düsseldorf? EI: So, is there any possibility of you coming over to this side of the Atlantic? RG: I really would like that! We’re just building our way, and probably, I hope, soon…I think we will! EI: It sounds like you’ve been so busy since Eurovision…well, really, since Sanremo! Have you taken any time to take a deep breath and relax? When you take time off, what do you do? EI: Thinking about the Eurovision experience itself: out of twenty-five songs in the Final, you came in second place, and the Jury put you in first. The huge scale of it: the arena held over 30,000, and the night of the final had over 70 million people watching. Has it sunk in, how huge of an experience it was? When you look back on it, what do you think? EI: You were at Eurovision for a little bit over a week. What was your favorite memory from your time in Düsseldorf? RG: Well, the memory of joy from seeing people from different countries joining together and making music. I know that with popular music, you get different kinds…but to see more than forty countries just joining together…you see how much power can be with music. I don’t believe in contests, but it can help people meet and cooperate with each other, like I did with the 3Js and some other people. But it’s great, the most important thing! EI: You mention working with the 3Js [2011’s representatives from The Netherlands]. I read on another website that you’re planning another collaboration with them; is this true? RG: Well, why not? I have no official news on that, partially because I’m so taken up by my work, I cannot say. I have some things to talk about with my label, but I think so! I think we’ll have some gigs together. I don’t know what’s going on, but if I have some news, for sure I will communicate with you. EI: Is there anything you would change about your experience [at Eurovision]? RG: At the moment, about this experience in Germany, I wouldn’t change anything! I was that everything was perfectly set and perfectly organized. It was amazing…it’s certainly not so easy to work with so many people and their delegations, so I think that it was great. It was all very good, and I wouldn’t change anything. EI: Now, when you came from the Sanremo Festival and were selected to go to Eurovision, you didn’t know very much about the competition. It’s not very well known in Italy, and even this year, only about a million viewers watched the Final. But now, with the possibility of Italy taking part more often in Eurovision, what advice would you give other Italian singers and songwriters about your experience? RG: What I can tell is, for sure, that we didn’t take this opportunity, and we didn’t have this choice for so many years, that many people probably, a little bit, forgot about it. Today, one of the questions that people often ask me is ‘how many people waited for you at the airport [when you came back from Düsseldorf]?’ And the answer is ‘nobody’! Very few people…they really follow Sanremo, so [Eurovision] is not so popular….I can say to the Italian people that the Eurovision Song Contest is a contest of pop songs, but it’s very good experience. First of all, it gives you the possibility to express yourself in front of an amazing audience of viewers, and an amazing audience live. At the same time, it’s an important occasion of collaboration. I always say, like that song…[singing] ‘Always look on the bright side of life!’ [laughs] Like that, you know? So big of an experience…people really need to know that. If you have the possibility…it’s part of our business. It’s a great occasion to…bring your music to so many. It’s three minutes of magic. Some might think that such success, even in a niche market like the world of Jazz (or, for that matter, the world of Eurovision), might go to a man’s head. But when Raphael and his delegation returned to the Press Center after the Final, with dozens of people crowding around the newly-minted silver medalist, the soft-spoken pianist from Urbino with the old soul and boyish smile took the camera flashes and sudden attention with the same quiet humility that he showed on the stage at Sanremo only a few brief months earlier. For Raphael, it has always been about the music, not the fame or the spectacle. At one point, when a small group of volunteers asked him for a photo, he quietly took their camera and pointed it at the four young women, seemingly unaware that they wanted him to be in the photo, as well. After I took the camera from Raphael and snapped a group shot for his giggling group of fans, I gently reminded him that yes, he was the celebrity here.